Also known as composite fillings, white fillings are designed to match the color of your teeth. They can be used to restore a decayed tooth or repair a defect. Although they are often used on the front teeth where a natural appearance is important, they may also be used on a back tooth when the restoration is small or may be visible. How are white fillings done? 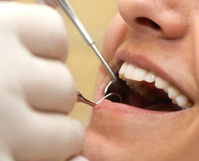 Like silver fillings, composites can be prepared and placed in one visit. After the decayed portion of the tooth is removed, your cosmetic dentist will use a very mild acid solution to “etch” the tooth surface. A bonding agent is brushed onto the prepared tooth, followed by several thin layers of the tooth-colored composite. Once the composite filling is placed, the material is chemically hardened, or cured, with a special light, and polished. There are many reasons why most dental patients choose white fillings over the traditional metal fillings. Many patients feel that the white composite fillings represent a more advanced technology. Composite fillings are also more aesthetic and resistant to fracture. If you have a growing cavity or wish to fix a tooth defect, white fillings may be right for you. You can also replace old metal fillings with more attractive white fillings.